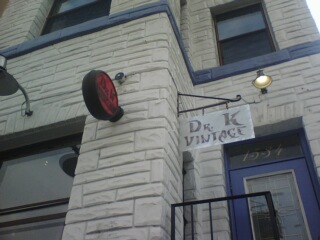 I walked by yesterday and was happy to see a sign up at Dr. K Vintage (16/U). Then I noticed a handwritten “OPEN” sign in the front window. Hooray! I didn’t have the time to stop in (nor anything other than my phone to take a picture with) but I will soon. UPDATE: The owners have written in to let me know they are open everyday from 1 to 10 pm. Stop in! I had a day off today thanks to an awesome compressed work schedule. I had quite a list: go to yoga, bake, cook, do laundry, do dishes, and check out the Meridian International Center, finally. I’d been meaning to go, and after reading Prince of Petworth’s post on it a few days ago, I was determined to actually go. To get there, walk up Belmont or Crescent off of 16th street. The Center encapsulates several buildings, but the White-Meyer house, at 1624 Crescent Place NW, houses the gallery. The buildings are beautiful, great architecture, great details, I was in heaven. The gallery currently has an exhibit on “Paintings in the Heart of Russia” featuring Nikolai Timkov’s paintings. It runs through March 8th. It’s small, but the exhibit is pretty great. Timkov was a painter during Soviet Russia, and he had to conform to the Soviet concepts of what “art” should be, though his painting style isn’t very typical of the realism that Stalin named the only acceptable form of painting. He focuses on landscapes, mostly of winter, with bright, beautiful colors, amazing textural canvasses, and impressionist touches. The paintings don’t feel like they were painted in the 20th century, but rather the 19th. There are touches of abstraction here and there, but mostly you can tell that Timkov really dug the French impressionists. While the exhibit is open during very limited times, Wednesday through Sunday from 2-5 pm, you should go. The buildings are fabulous and the exhibit is very interesting, particularly if, like me, you know next to nothing about Soviet art. The mission of the Meridian International Center is “advancing international understanding through public diplomacy and global engagement,” so it’s pretty cool they also host a well-curated art gallery, donated by the Caftritz Foundation. The two buildings the Center are housed in have an interesting history: the White-Meyer house was built in 1912 and the original owner was Henry White, former Ambassador to France. The next family to live there were the Meyers, owners of the Washington Post; Katharine Graham grew up in the house. The Meridian International Center purchased the property in 1987. The Meridian House was built in 1920 by another Ambassador to Greece and Spain, Irwin Boyle Laughlin. The Center purchased the house in 1960, shortly after it was founded. The garden also looks like it will be lovely in spring, and I hope it’s at least sort of open to the public. Much more pictures after the jump.